Up to 40 U.S. soldiers from the 82nd Airborne division were dropped off a CH-47 Chinook in an air assault on a Taliban position in southern Afghanistan shortly before the helicopter crashed. 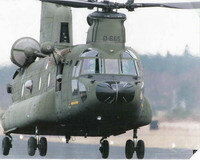 The Chinook's plunge late Wednesday in Helmand province killed five Americans, a Briton and a Canadian. It came on the first day of a new joint NATO-Afghan operation to force Taliban fighters out of northern Helmand. Maj. John Thomas, a spokesman for NATO's International Security Assistance Force, said the Chinook - a heavy lift twin rotor helicopter - had just dropped off a full load of troops before it went down. He did not know how many troops were on board but said it would likely have been between 30 and 40. "It was a hostile area, where the helicopter went down," said Thomas. Thomas said "initial indications" were that enemy fire may have brought down the Chinook, and a U.S. military official, who insisted on speaking anonymously because the crash was still under investigation, said initial reports suggested the helicopter was hit with a rocket-propelled grenade. The Taliban claimed responsibility for attacking the aircraft. But Lt. Col. David Accetta, the top U.S. military spokesman at Bagram, said enemy fire was only one of several possibilities. "We will investigate thoroughly," he said. "There's no solid evidence we can point to that suggests it was shot down." It was not clear how many minutes after the helicopter dropped off the U.S. troops that the helicopter crashed, Accetta said. The troops would not have landed on "a hot landing zone" - a spot full of Taliban forces, he said. But troops would have landed within range of enemy fighters so that the ISAF forces could attack them. The U.S. military, which carries out aerial bombardments in support of NATO, said "a large number of insurgents" were killed. The British Ministry of Defense announced that NATO and Afghan troops launched the operation early Wednesday. The U.S. soldiers and the Briton killed have not been identified. The Canadian soldier was identified as Master Cpl. Darrell Priedge, a combat cameraman. Some 2,000 ISAF and Afghan forces are taking part in the new operation, Britain's Ministry of Defense said. The offensive includes forces from Britain, the U.S., Denmark and Estonia. "This is certainly not a major fresh offensive but a continuation of the progress made by NATO's Operation Achilles launched in March," said Lt. Col. Charlie Mayo, a British military spokesman. Mayo said the continued presence of Taliban fighters in the upper Sangin Valley was putting at risk previous "good work" done in Helmand, the world's largest producer of opium poppies and a Taliban stronghold. In fighting reported elsewhere, Taliban militants ambushed a police convoy in Shahjoi district of southeastern Zabul province on Wednesday, sparking a gunbattle that left 16 police and 10 suspected insurgents dead and six police wounded, Interior Ministry spokesman Zemeri Bashary said. After a winter lull in violence, both militant attacks and military operations have escalated this spring. More than 1,800 people have died in insurgency-related violence this year, according to an Associated Press tally based on figures from U.S., NATO and Afghan officials.